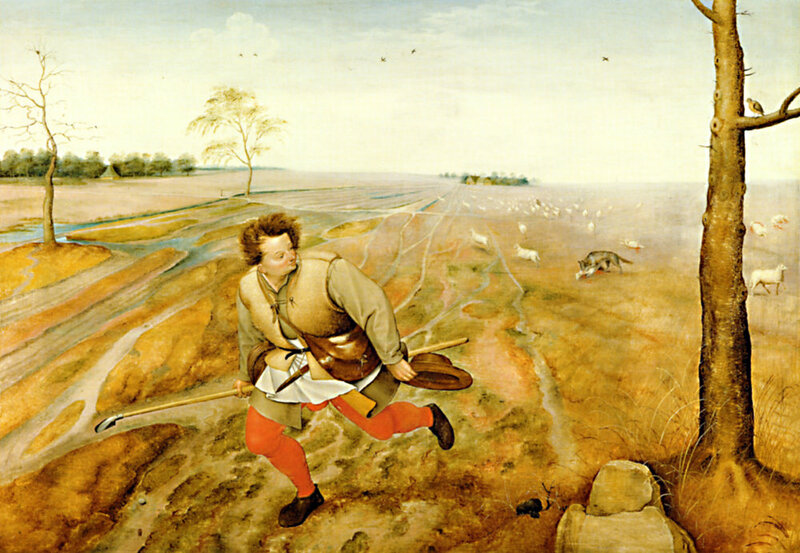 "The Bad Shepherd," Jan Brueghel the Younger, 1616. Wikipedia Commons. Tim Russert is a great journalist, but he made a mistake last weekend. He included Jerry Falwell and Al Sharpton in a discussion on religion and public life. Inviting these two bozos onto "Meet the Press" to discuss that issue is like inviting Britney Spears and Larry Flynt to discuss D.H. Lawrence. Naturally, they got into a demeaning food fight that would have lowered the intellectual discourse of your average nursery school. This is why so many people are so misinformed about evangelical Christians. There is a world of difference between real-life people of faith and the made-for-TV, Elmer Gantry-style blowhards who are selected to represent them. Falwell and Pat Robertson are held up as spokesmen for evangelicals, which is ridiculous. Meanwhile people like John Stott, who are actually important, get ignored. It could be that you have never heard of John Stott. I don't blame you. As far as I can tell, Stott has never appeared on an important American news program. A computer search suggests that Stott's name hasn't appeared in this newspaper since April 10, 1956, and it's never appeared in many other important publications. Yet, as Michael Cromartie of the Ethics and Public Policy Center notes, if evangelicals could elect a pope, Stott is the person they would likely choose. He was the framer of the Lausanne Covenant, a crucial organizing document for modern evangelicalism. He is the author of more than 40 books, which have been translated into over 72 languages and have sold in the millions. Now rector emeritus at All Souls, Langham Place, in London, he has traveled the world preaching and teaching. John Stott was not our pope. Neither was Falwell, Sr. in Russert’s day. Neither in our day are Falwell, Jr. nor Robert Jeffress nor James Dobson nor Kenneth Copeland nor Paula White nor anyone else who serves steadfastly on Trump’s “Evangelical Advisory Board.” We evangelicals don’t have a pope. Immediately after the election, a hashtag emerged: #NotMyPresident. It received a great deal of ridicule, because of course, the Electoral College upheld the constitutionality of Donald Trump as the 45th President of the United States. I was struck harder by a hashtag that appeared from a young friend. She wrote: #NotMyElders. She was tweeting in response to yet another unbiblical and unloving statement by Franklin Graham about Muslims and refugees. Franklin Graham was NOT her elder. And it is true: she grew up never knowing Franklin’s father, Billy Graham. Why should she care? And why should we care that Franklin happens to be Billy’s son? (Graham’s own autobiography confesses that he did little to disciple his own children.) And for that matter, Billy Graham was never our pope anyway. He doesn’t speak for us. The latest round of headlines that read “Evangelicals Support Trump” came out after Charlottesville, and this time, the headline was not based on any statistical projection about the majority (or plurality, please) of evangelical Christians. It was only based on the responses of the handful of men and women who form Trump’s Evangelical Advisory Board. * If you want to scan through their names, included below in a footnote, you can do this little exercise. How many of these names do you even recognize? (I scored 11 out of 26.) Of the names you know, how many did you respect BEFORE the election, let alone now? (I scored 0 out of 11—though I still grieve my loss of respect for Dobson the child psychologist.) Former Minnesota Congresswoman Michelle Bachmann?!! Really? No, she is NOT my elder, and any headline that claims “Evangelicals Support Trump” based on Bachmann’s support has no hold over me. Businessmen from Trump’s Council of Business Advisors bailed out quickly and vocally after Trump’s white nationalism became evident with Charlottesville. I lamented publicly that only A.R. Bernard seemed to possess the same strength of conscience and so resigned from the Evangelical Advisory Board. But now I understand that this was NO test for American Evangelicalism’s response to white nationalism. Trump’s Evangelical Advisory Board may speak TO Trump but they don’t speak FOR me, nor for any sort of evangelical Christianity that I recognize. “Let the dead bury the dead,” a friend advised me helpfully on Facebook. Let whitewashed sepulchers belch their noxious gasses. Why should we care what they think? Liberty University professors and students can’t very well say that Jerry Falwell, Jr. is #Not My President, but there is plenty of evidence to suggest that many of them consider him #Not My Elder. A couple years ago, the city of Lynchburg, VA voted into existence a separate voting district for Liberty University. Students could now vote on campus. They are the Third Ward, Second Precinct. Now admittedly, in the general election, the newly minted precinct went overwhelmingly for Trump over Clinton, but the results of the presidential primary are interesting. Falwell Jr. infamously endorsed Trump on January 26, 2016. Less than two months later however, on the day of the Virginia primary, Liberty’s precinct went 43.62% for Rubio, 32.91% for Cruz, and 13.78 for Carson. Falwell’s pick—Trump—only got 7.65% of the vote. If you are leading, but nobody’s following, are you really a leader? Do you remember the (Reverend) Fred Phelps of Westboro Baptist Church in Topeka, KS? He used to organize protests at the funerals of slain servicemen with signs that read, “God Hates Fags!” I was raised as a Baptist in the State of Kansas. Shame, being what it is, never asks permission to be shared, and yes, I was embarrassed that Phelps called himself a Christian, a Baptist, and a Kansan. I grieved that so many people stepped away from the lovely and loving Jesus Christ because they mistakenly thought Phelps represented him. Nonetheless, I never felt self-implicated by Phelps nor did I feel that Phelps implicated my tribe. I knew that Phelps represented the far end of a temptation that my tribe might one day choose: namely to not include in God's love those of God's creatures who are LGBTQ, even though they are created in God’s image, even though Christ died for them too. Falwell Jr., Jeffress, White and others on Trump’s Advisory Board are on the far end of a white nationalist, proto-fascist idolatry—but I refuse to be self-implicated by them. I reject the shame. And, sometimes, I even find the courage to enjoin the battle. Why should we allow Trump and Falwell to get any more than 7.65 percent of true followers within our churches? Why should we let them get any? Reputed national evangelical leaders who attract the headlines? Of course, the difficulty are those men and women (primarily men in our conservative churches) who do serve as Elders and Pastors in our local churches. I can see their faces. I can recite their names. I have prayed for them, with them, and they have prayed for me. They are my elders. I feel enjoined by such verses as 1 Thessalonians 5:12: “But we request of you, brethren, that you appreciate those who diligently labor among you, and have charge over you in the Lord and give you instruction,” (NASB). These pastors and elders cannot be dismissed so easily—not in our hearts, not in our past relationships, not in our practice of the “one anothers” of Scripture, not in our continued participation in our local evangelical churches. These elders seem to fall into three categories: 1) those who voted for Trump and are true believers after the mode of Falwell and Jeffress; 2) those who silently voted for Trump when they could have just as easily, and more advisedly, done something differently—without voting for Hillary; and 3) those who didn’t vote for Trump but who either remained/remain silent in opposing Trump, or silent in shepherding us through this spiritually-agonizing season. These elders are more important to us, and reconciling with the facts and relationships of their sounds or their silences will have to await future articles in The Liberator Today. *Michele Bachmann, A.R. Bernard, Mark Burns, Tim Clinton, Kenneth and Gloria Copeland, James Dobson, Jerry Falwell, Jr., Ronnie Floyd, Jentezen Franklin, Jack Graham, Harry Jackson, Robert Jeffress, David Jeremiah, Richard Land, James MacDonald, Johnnie Moore, Robert Morris, Tom Mullins, Ralph Reed, James Robison, Tony Suarez, Jay Strack, Paula White, Tom Winters, Sealy Yates.